Fry the garlic, shallots and carrots in a heavybased saucepan over a medium heat, stirring, for 1-2 minutes or until soft. Add the lemongrass, chilli and curry powder and cook for 3 minutes or until fragrant. Add the coconut milk, 200ml (7fl oz) water and fish sauce to the pan and bring to a simmer. 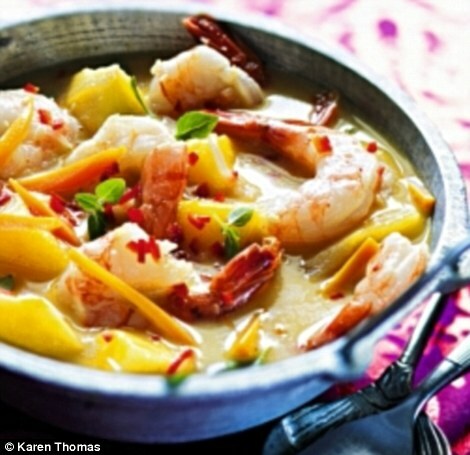 Cook for 5 minutes and then stir in the prawns and mango. Simmer, partially covered, for 3-4 minutes or until the prawns are pink and cooked through. Garnish with basil leaves and serve with steamed jasmine rice.